Here’s a roundup of the latest developments in the top U.S. scrap plastic export markets. In early October, regulations took effect reducing the types of material allowed for import. According to the Tai Pei Times, companies can only import post-industrial plastic from their overseas production facilities or loads of a single material type. It’s unclear whether certain polymers are banned altogether. Recycled paper imports have also been heavily limited. Shipping company APL also added Taiwan to the list of countries it will not ship scrap plastic to as of early October. Another shipping line, Hapag-Lloyd, told customers that loads in violation of the new restrictions would be returned with penalty charges to the exporter. As a result, Hapag-Lloyd is requiring plastic exporters to submit a letter of indemnity before a shipment can take place. Vietnam: The ban on recovered plastic imports coming through major Vietnamese ports was scheduled to end on Oct. 15, but it has since been extended until further notice. In the weeks that followed, Vietnamese authorities implemented a variety of new guidelines. For example, the government released information about how inspections will now be conducted. Additionally, it released regulations covering contamination limits. They differentiate between different types of contamination, according to an online translation of one document. Recycled plastic shipments cannot contain higher than 2 percent “impurity” content. For a scrap plastic bale, “impurity” means any of the prohibited plastic grades (plastic from electronics or other resins containing flame retardants, as examples) or any non-plastic substance. But a bale of one commodity can have up to 20 percent of its weight consist of another allowed commodity. For example, a post-consumer PET container bale could seemingly contain up to 20 percent post-industrial scrap plastic under the guidelines. Vietnamese officials sent a letter to customs departments around the country this month, instructing them on the new regulations. More restrictions could be on the way, with officials considering revising the list of scrap commodities that can be imported. This process has been ongoing since July, and various types of scrap plastic and paper have been proposed for removal. Industry associations have expressed concern about the ramifications for manufacturers. Malaysia: Plastics Recycling Update reported late last month on import requirements the Malaysian government is working on. It’s unclear when those rules will take effect. In the meantime, the government is not issuing import licenses for scrap plastic. 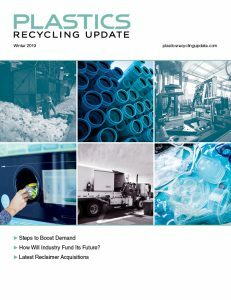 Steve Wong, executive director of the China Scrap Plastics Association, told Plastics Recycling Update that Malaysia is proposing to only allow scrap plastic from the U.S., Europe and Japan. China: The Chinese government has confirmed it will ban additional recovered materials, including post-industrial scrap plastic, at the end of the year. China announced in April that the expanded ban was coming. The confirmation was made public by Chinese state media agency Xinhua last week.